Local Gift Options from The Mustard Seed! Give the gift of LOCAL this year! We’ve got lots of options for everyone on your list, and all of these selections come wrapped and ready to give! 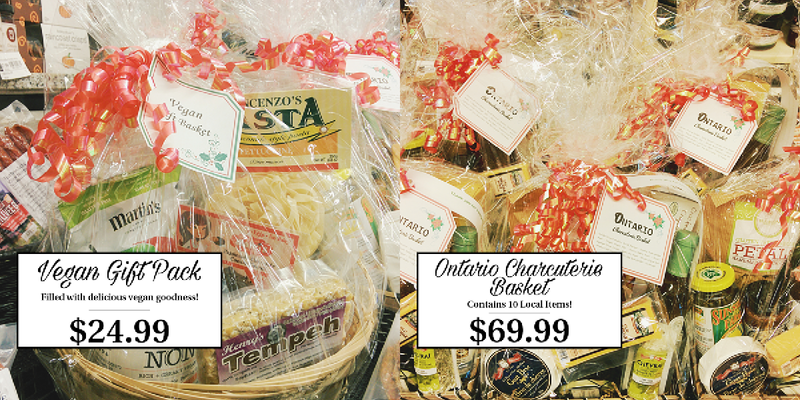 These gift bags are available in-store only…c’mon by to check them out, and get your Christmas shopping done locally! Tea & Scones: Everyone’s got a tea lover in their life. This is a great gift combo – looseleaf Lady Earl Grey Tea with our favourite scone mix, both from Tea At The White House. Whoever gets this gift can do their baking over the holidays, or save it for a special day – either way, these will be some of the best scones they’ve ever had! Hot Cocoa Kit: A perfectly cozy gift at an amazing price point! Enjoy our very popular ‘Silly Cow’ hot chocolate with made-from-scratch Cake and Loaf Bakery marshmallows and a decadent Hotti Biscotti treat! Wrapped and ready to give for $16.99. Caesar Kit: Got a Caesar fan in your life? This gift pack contains everything but the alcohol – would pair nicely with Dillon’s gin, available just down the road at the LCBO or at their distillery in Lincoln, Ontario. Tastebuds will jump for joy when they try these dillies from Barrie’s Asparagus Farm, and our incredible Alderwood Smoked Sea Salt. Spicy Snacker: Perhaps the snacker in your life likes to spice things up a bit! They’ll be putting these Stasis hot sauces on everything! Add some Picard’s peanuts and beef jerky and it’s an all-around GREAT gift for some holiday indulging. Snack Pack: Know anyone who likes to snack? Oh wait, that’s basically everyone so this gift is sure to be a hit! Contains a very popular Co-op duo: the Alba Lisa tortilla chips and From These Roots peach salsa – an amazing combo! Also contains Picard’s Beernuts and some amazing pepperettes from VG Meats. All for $19.99! Honey & Glow: Know someone that’s obsessed with bath products? Got any lavender fans in your life? 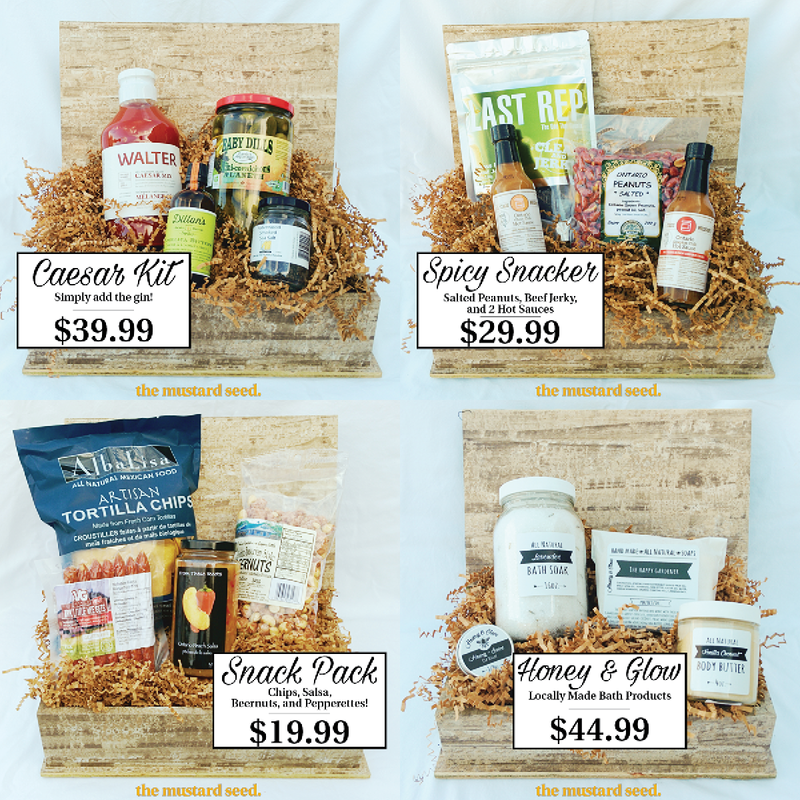 The perfect gift for someone who needs some relaxing self-care, this gift pack is filled with high-quality, locally-made products. Includes Lavender Bath Soak, Lavender Body Butter, ‘Luscious Lavender’ Soap Block, and Honey & Spice Lip Balm for $44.99. Dawson’s Hot Sauce: If they like hot sauce, they’ll LOVE Dawson’s. Made right here in Hamilton – choose whichever three you’d like for $29.99, and we promise they’ll be hooked. These would also make great stocking stuffers! Dillon’s Bitters: For the craft drink maker in your life – these are exactly what they’ll want to mix up some incredible cocktails! 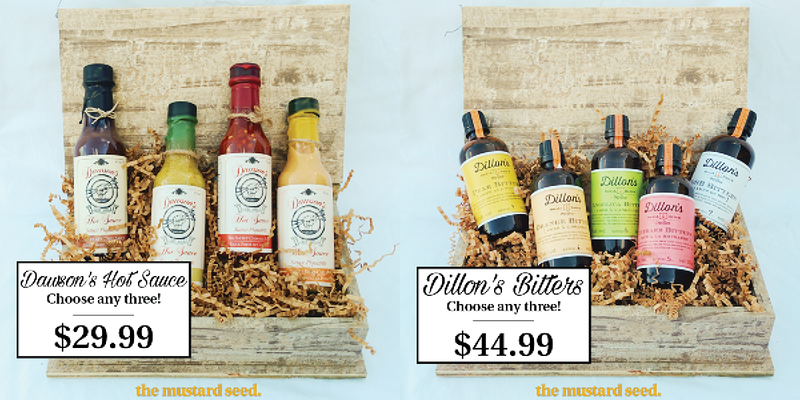 Choose any three for $44.99 – they come in a great Dillon’s 3-pack box that would be a great gift under the tree. Vegan Gift Pack: For the special vegan in your life! Contains some unique and delicious vegan options – Vincenzo’s Pasta, Nona’s Cheesy-Style Sauce, Henry’s Tempeh, Martin’s Apple Chips, and Marci’s ‘Passionate Chocolate Cookie’…all this for $24.99!